Got an unbeatable idea and want to hold an ICO? Don’t know how to run an ICO? Cryptassist ICO Assistant helps project founders to launch an ICO in order to raise capital for a project. For a percentage fee, project creators will be able to create tokens through a simple process and will be able to list them on Cryptassist’s fully licensed exchange. All projects will have a profile on the Cryptassist platform where potential backers will be able to see the teams, their previous experience and extensive information on the projects. There will be a live chat feature so that project creators and backers can communicate and news and regular updates on the ICOs can be given. Profiles will have links to the ICO websites, Whitepapers and Roadmaps. A thorough KYC for project founders will be required to offer security to backers of the projects. Escrow Service – Cryptassist will act as an escrow service and hold funds to demonstrate transparency to backers, creating security for all parties involved. ICO Auditing – Cryptassist will carry out a thorough screening process of all aspects of the project to ensure that the structure is comprehensive and can function as proposed. If the project is not found to be feasible, the project will not be supported. Translations – Cryptassist will translate the website and whitepaper of projects to maximize exposure to international markets. ICO Consulting – Cryptassist will review each project proposal to assist creators in launching the most successful project possible. Website Creation – Cryptassist will create visually compelling websites that communicate the projects’ unique visions to potential investors. Community Management – Brand promotion on social media to gain potential customers. Technical Advice – Cryptassist will review technical specifications and infrastructure and make recommendations if improvements are required. I'm sure that Cryptassist will show good results for ICO! Cryptassist with an innovative approach, a very interesting road map! Promising! your ICO ASSISTANT feature it's really amazing, will help who's wanna launch ICO, and also there's a lot of amazing feature on your project.. Hoping through this Cryptassist feature, people will avoid losing their hard earned moolah due to bad ICOs. It's also interesting to note that when ICOs list their project thru CTA platform, they will be able to list them on the CTA exchange. This idea is very great and useful for enterprenurs and ico developers. The creation of ico in this era is common but how to create is the point. The platform given by @cryptassist is more powerful tools. I am glad to be here..
Great project with great concept. One of the best recommendable to invest project this year. Good job guys. Keep up the innovations. Interesting project. Great team. Guys well done!!! This project looks promising. Good luck everyone. all the things you need to start an ico. it is so convenient! Excellent service and convenient interface, wide functionality with great prospects. This platform is useful not only for beginners, but also for advanced users. I will always follow your updates, because I believe in the success of the whole platform. CryptoGo can be downloaded and played for free. Players have the opportunity, when they are at nominated locations, to locate coins that are airdropped and use Cryptassist coins (CTA) in order to capture these coins. the venture is the one is top recorded, I can see development of network intrigue. a debt of gratitude is in order for the offer this data. A lot of advantages! Great project! Good project. Very nice cocncept i'm support to program. Good luck! This is great news. Thanks to the #Cryptassist team for the information. I believe that the proposal to create your ico on the Cryptassist platform is a great opportunity not only for the ico creators themselves, but also a very good step towards the successful development of the Cryptassist platform itself. It is important now not to miss this great opportunity and join ico Cryptassist as soon as possible. Obviously assistant will help us a lot. Cryptassist ICO Assistant will be unique, the most complete ICO creation service I've ever seen, is sure to be highly sought after by the project founders. Cryptassist mission - to supply everyone w/ access to the world of crypto-assets through an array of essential tools, w/ everything from trading & news alerts, OTC exchange & even a debit card. No platform exists w/ so many easy to use crypto-related features. Really nice project.I recommend to everyone to become a part of this wonderful project. Its has a potential to easily reach their desirable goal. The cryptassist ICO Assistant is a revolutionary breakthrough in the crypto community as this feature would help project founders with great innovation get the support from members on the cryptassist platform. Great job team this would help solve the recent cases of failure of ICOs that have very promising project. Awesome platform, absolutely amazing section on the blockchain and their initiative are very good and helpful. Your goal is to make people happy in their life and that was amazing. Best team and high efforts for all of this. Big tank's to you, Team! So many great opportunities with cryptassist. Already one of my favorite projects so far this year. Professional, detailed, innovative. Fulfil the prospects and everybody wins! !! Review their project and learn more about their company. Since we are just at the infancy of this tech, more and more projects will surely come and will be needing a way to be able to market and sell their tokens. This will help those who want to brave the world of ICOs. the project is the one is top listed, i can see growth of community interest. thanks for the share this information. The support features of CryptassistCOin bring to customers and users interesting experiences. Peace of mind and comfort as Cryptassist has all the support features for all of your needs. This is quite extensive report with a lot of updates. #CryptAssist project definitely develops with quite rapidly. the undertaking - that, the enrolled top, I see improvement of a system interest. an appreciation obligation - for the offer these information. This is the greatest team that I ever have seen. They really work hard in order for the project to become great. Th project helps propel new project to success. Great venture. I prescribe to all to end up a piece of this noteworthy venture. Has potential effortlessly to accomplish them the attractive destinations. This is a very promising project for me!! Trading with crypto currency will be a very familiar thing to all of us in future. ICO audit is a very good function. This one will save your time, because system itself will doing audit. The trader or investor will immediately understand whether he needs this project or not. It is so much fine open doors with cryptassist. Effectively one of my most loved ventures still this year. The project shows great success! Cryptassist ICO Assistant is excellent tool on Cryptassist Platform. Now with this tool founders of project will be able to launch ICO to raise capital for project implementation. One of the most innovative tools to include on the Cryptassist platform will be Cryptassist's ICO Assistant. Based on their individual needs, project creators will be able to choose from multiple packages offered by Cryptassist. This seems like a very helpful tool in supporting investors in their everyday lives. The projects covers really a very wide spectrum! I love it CryptAssist will help those new to ICO, they will be the who managet it. A standout amongst the most inventive instruments that will incorporate on the Cryptassist stage ICO'S Assistant. 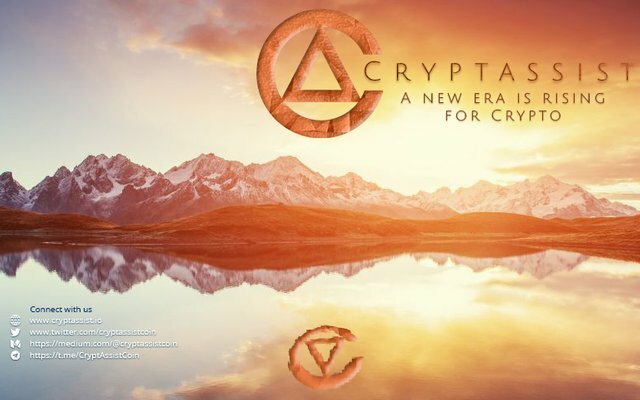 Based on their individual prerequisites designers of the undertaking will have the capacity to browse the rehashed bundles offered Cryptassist. I hope it would help to reduce the costs of holding an ICO and will open the doors to people with great ideas but the lack of money! This is a complete platform with attention to details for the benefit of crypto world. The world owe #CryptAssist some appreciation. The user’s cryptocurrency will be immediately converted into fiat and the card can be used as any other debit card. How are you going to prevent scammers from using your platform to run an ico ? The kyc is a proof that the project is very serious and solid! Compliments! Cryptassist brighten the future of crypto by giving solutions to the problem that the are facing now a days. This service will maintain transparency for the participants, creating security for all parties involved.